Born in Manhattan, Piers is based in New York City where he records, performs and teaches guitar. He combines a soulful approach, precise technique, and a clean old-school tone with the upmost respect for the geniuses of Modern Jazz and a deep love of the Blues. After studying Guitar and Composition at the Conservatoire de Musique in Lausanne Switzerland, he returned to New York to join the Jazz-Mobile Orchestra Big Band and continue his studies with jazz guitarists Barry Galbraith and Ted Dunbar. With the encouragement of session guitarist Ritchie Resnikoff, he joined the orchestras of several Broadway shows including Guys and Dolls, Dancin', Hubie, and Your Arms Too Short to Box With God. Piers has worked as a session musician, recording 100s of jingles and record dates. He has toured and recorded with a diverse group of artists including Wilson Picket, The Main Ingredient, Ester Phillips, Phyilis Hyman, and Phil Collins and his original songs have been recorded by various artists. Guitarist Piers Lawrence realizes his dream of recording a mainstream jazz album through a well- balanced mix of originals and standards. Lawrence is a confident player with an ear for melody and flowing harmonies. He has a graceful quality that gets into the songs whether he is out swinging or embracing bop. Lawrence also comes off as a skilled writer through his three contributions to the set. Samba Christina is, naturally, a samba. The guitarist feeds the tune with thick notes, deliberately letting open air in and then snapping on the notes to give them a solid depth. His sense of dynamics and proportion comes to the fore in his run of notes, a skein taken up by Chuk Fowler whose piano rides a trail of breezy phrases. Everytime, another Lawrence composition, is a ballad. Jim Hankins is recorded heavy on bass, a trait seen on other tracks but Lawrence soothes. He lets the beckoning melody unravel and soak in, then bites down, laying a harder line that ups the emotional factor. 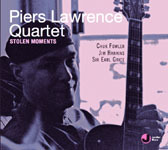 Stolen Moments features the exceptional musciality of guitarist Piers Lawrence, bassist Jim Hankins, Sir Earl Grice on drums and Chuk Fowler on piano. Lawrence's soulful, melodic guitar playing and prolific songwriting makes this CD a masterful offering for anyone into straight-ahead jazz. The CD features such great standards as Sonny Rollins' Pent-up House, Oliver Nelson's Stolen Moments, the rarely heard Charlie parker composition Donna Lee and the Fain/Francis gem Secret Love. While those standards may enamor the die-hard jazz enthusiast to the quartet's musicality, Lawrence's own Everytime and Dimanche are prominent showcases for their stellar interplay and Lawrence's ability to bring something new to the table for novice jazz lovers - be it a blues or a loving ballad. Hailing from the New York area, the Piers Lawrence Quartet issues what is apparently their debut album with a vibrant performance in a new 2008 release of a straight-ahead jazz CD entitled “Stolen Moments.” The album is the culmination of a long time dream of New York native and jazz guitarist Piers Lawrence. A self published recording on his own label (Jazznet Media), Lawrence is also producer and host of “Manhattan Jazz,” an internet radio show on www.tribecaradio.net . Lawrence includes three original tunes but starts off with the terrific and bouncy Sonny Rollins score “Pent-Up House.” Turning South, Lawrence takes off on his samba-shaded “Samba Christina,” delivering excellent runs on the guitar leading to Fowler’s solo play on the keys and a nice drum roll from Grice. The title piece and Oliver Nelson tune, “Stolen Moments,” is one of the best renditions around capturing that familiar melody quite well. The band picks up the beat and swings on Charlie Parker’s standard “Donna Lee,” where both the leader and pianist peel off some sturdy runs to make this one of the best charts here. Other notable tunes include Lawrence’s “Dimanche,” the Fain/Francis standard “Secret Love” and John Pastorius’s “Reza” to round out the set. “Stolen Moments” is another warm slice of straight-ahead jazz delivered by a guitar led rhythm-based quartet guaranteed to please jazz critics and the discerning jazz audience alike. Kudos to Piers Lawrence and crew for crafting an entertaining and engaging session of jazz. CD Review: http://www.midwestrecord.com/ PIERS LAWRENCE QUARTET/Stolen Moments: This crew comes across like a classic bunch of jazzbos. Recording the date in an afternoon mixing Rollins, Parker and Nelson with originals and some Jaco, the guitar led crew has the easy after hours vibe that flows from the Harlem renaissance in which most of them have some roots. Not showy but with a lot of flair, listeners that like their jazz straight up will simply dig this set. Well done throughout. All About Jazz musician pages are maintained by musicians, publicists and trusted members like you. Interested? Tell us why you would like to improve the Piers Lawrence musician page.